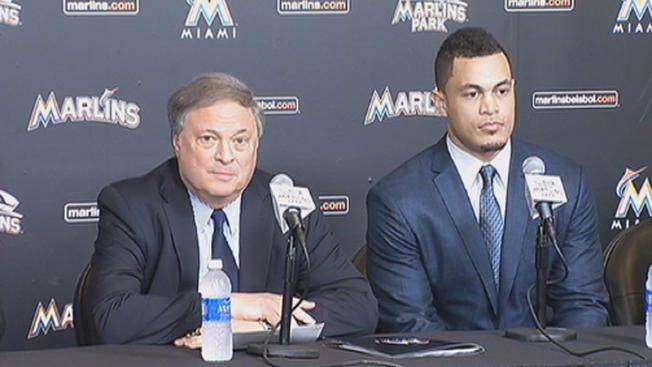 The Miami Marlins just officially signed Giancarlo Stanton to the single largest contract in american sports. He was signed to a 13 year $325 million deal. Michael Hill, Marlins President of Baseball Operations said, ” Step one was to get the big man locked up.” And obviously they have done that. Stanton and owner Jeffrey Loria. The money is of course the biggest thing that jumps out at you, but to put it into an overall business perspective the Miami Marlins came in 29th out of the 30 MLB teams for team payroll last year according to deadspin.com. They had a 2014 payroll of $47,565,400 and even if you add the highest dollar value for one year in the Stanton deal to that total payroll would make it $79,565,400. Out of the 30 MLB teams, the new amount would put them at 27th of the 30 teams. My point is, the Marlins have money to spend. 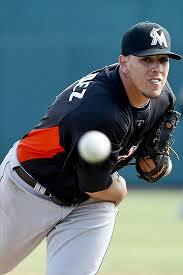 Marlins starting pitcher Jose Fernandez. You also have to look at the fact that the National League East is going through a change currently. The Philly’s are a mess, the Braves are making big changes in their front office and on the field, Washington has had success except in the post season, and the Mets are in roughly the same place as the Marlins. They have David Wright and signed Michael Cuddyer and have a good young pitching staff with the Rookie of the Year in Jacob DeGrom and a pitcher coming off injury in Matt Harvey much like Jose Fernandez for the Marlins. The difference is, last year the Mets spent $89,051,758. Almost twice what the Marlins spent. Again, the Marlins have money to spend. For me the big number for the Miami Marlins as it pertains to Gincarlo Stanton is $30 million. No, that is not what Stanton will make this coming season, or even what he will make the next 2 seasons combined, it is the amount of money that Stanton will make over the next 3 seasons. In fact, Stanton is not even the highest paid player for the 2015 season. Jarrod Saltalamacchia will make $7 million this year while Stanton will make $6.5 million. So, the Marlins do have money to spend over the next 3 years. And, if they spend it correctly,(I will start a series of articles next week looking at what each team needs to do to win) they could build a team where other big leagers want to come, play and win. Lets look at some of the particulars of the contract that during the press conference Stanton described as a “lifetime type contract.” As I stated earlier, in 2015 he receives $6.5 million in 2016 $9 million in 2017 $14.5 million then it starts to jump in 2018 his check will be for $35 million in 2019-20 he gets $26 million in 2021-22 the payout is $29 million then in 2023-25 he will take home $32 million in 2026 the amount is $29 million and the final 2 years of the contract will pay him $25 million each. He has an opt-out clause after the 2020 season, where if he chooses, he can then void the remainder of the contract and its $201 million payout and become a free agent. He also has a complete no-trade clause in his contract. 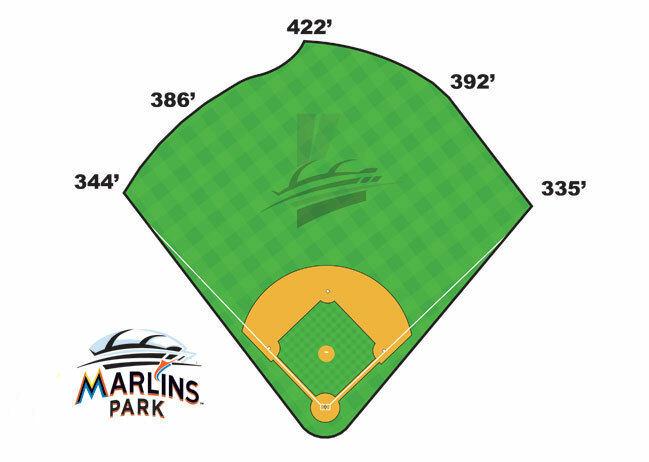 Marlins Park is a long way to hit a home run, even for Stanton.